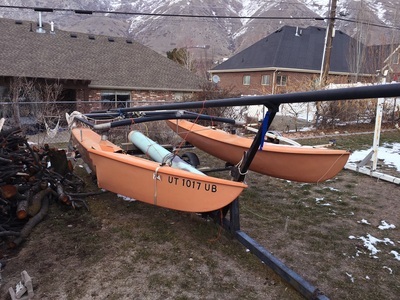 Several years ago, I picked up my first sailboat, a Hobie 16. It needed some work, including new lines and rigging. After several months, it was finally ready to sail. It didn't take long to realize the port hull took on water while under way. 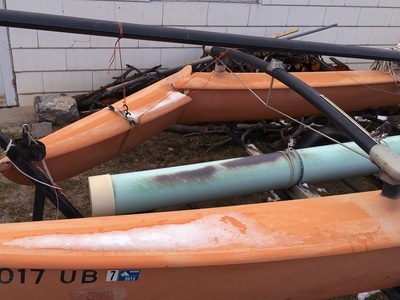 ​The boat stayed in the driveway for a few months while I inspected both hulls and mulled over what to do about it. The starboard hull felt and appeared fine. The port hull had a soft spot amidships underneath the trampoline just aft of the front crossbar. Apparently, this was the source of the gradual water leak, no other chips or damage to the fiberglass was noted. 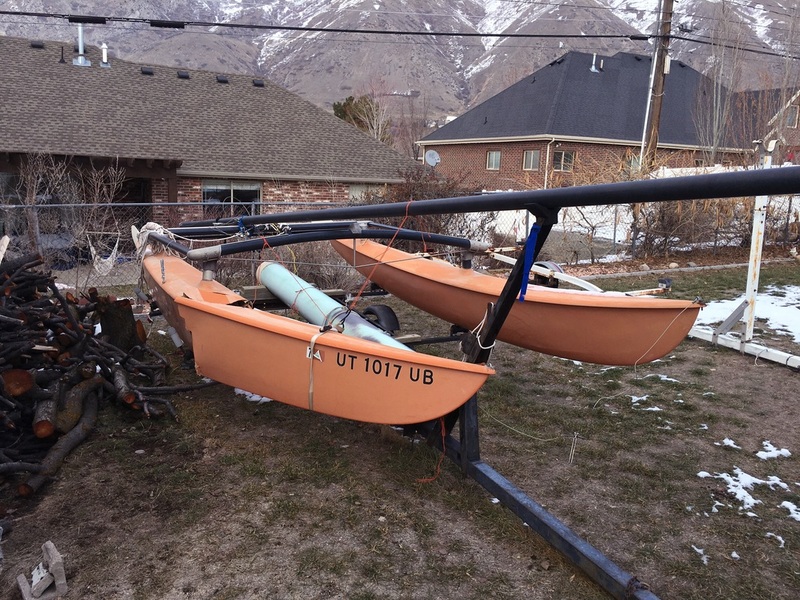 Ultimately, I decided to sell the Hobie to my brother, who turned it over to his son to sail. Not long after, I discovered this orange Hobie 16 in a local classified ad. 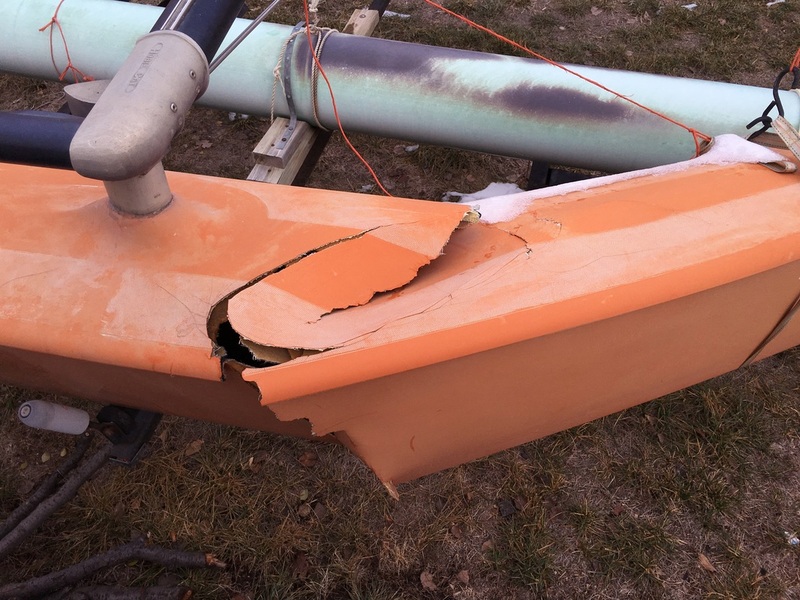 Aside from the damaged hull, the boat was complete and even had a new trampoline and new sails. 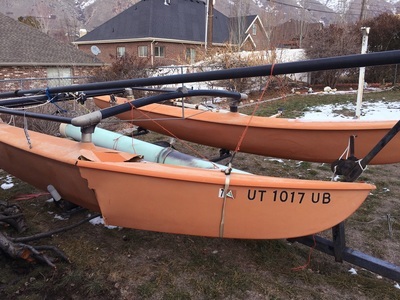 The previous owner said they were in rough water at Bear Lake, UT when the crewman stepped off the trampoline frame and onto the starboard hull in an effort to better distribute weight and prevent the boat from capsizing. Unfortunately, this was more weight than the hull could bear, and after coming off a wave, the hull gave way. A couple of guys on waverunners saw it happen and towed the broken boat to the docks. The hull filled with water, the weight of which bent the trailer as it was pulled from the lake.